FDA Mandates Tougher Warnings On Testosterone : Shots - Health News The agency says the labels for testosterone drugs must state they aren't approved to fight aging and may increase the risk for heart attacks and strokes. 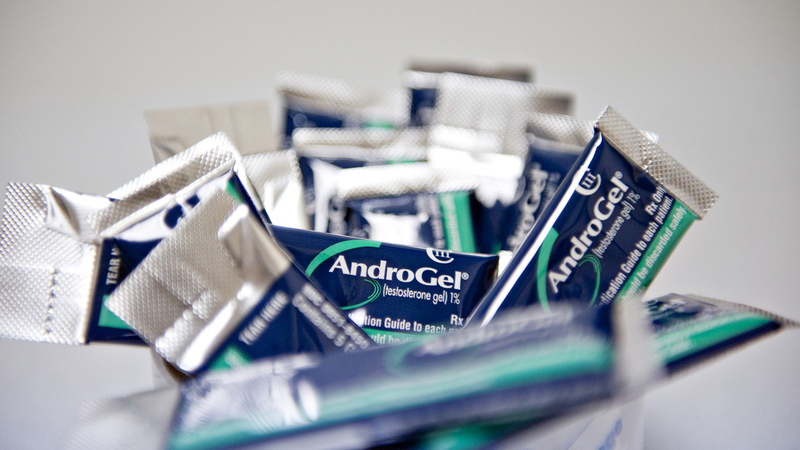 AndroGel, a testosterone replacement made by AbbVie, is seen at a pharmacy in Princeton, Ill. The Food and Drug Administration said Tuesday that it is requiring drugmakers to warn patients that testosterone products may increase the risk for heart attacks and strokes. Testosterone replacements are approved to treat men with low testosterone related to medical problems, such as genetic deficiencies, chemotherapy or damaged testicles. But the level of the hormone can fall as men grow older. And testosterone is increasingly being prescribed to men to stave off aging, something the agency never approved. Doctors and specialized clinics have jumped on the bandwagon, offering testosterone replacements to treat what some refer to as "Low T."
But in a drug safety warning, the FDA said there's no good evidence that testosterone can help counteract the effects of aging. "The benefit and safety of these medications have not been established for the treatment of low testosterone levels due to aging," the FDA's statement says. So the agency is requiring drugmakers to make that crystal clear on the instructions for their testosterone products. The FDA is also requiring that drug companies conduct a study to get a clearer idea about just how risky testosterone replacements are. Last September, an advisory panel to the FDA voted 20-1 in favor of changing the labels for testosterone replacement therapy to reflect the risks and clarify the narrow indication for their use. The panel also voted 20-1 in favor of FDA requiring a study of the risks. AbbVie, one of the leading marketers of testosterone replacements, said in an email that it had received the FDA's safety communication and the request for a labeling change for all testosterone replacement therapies. "TRT is an important men's health topic," the statement said. "AbbVie is committed to our patients and we continue to work with the FDA." Public Citizen's Health Research Group, a consumer group, criticized the FDA for not issuing a stronger warning sooner. The group had petitioned the agency last year to issued the strongest warning possible — a request the agency had rejected. The group noted that the Canadian government had issued warnings earlier. "In the seven and a half months since the Canadian action, approximately 4 million prescriptions have been filled in the U.S.," said Dr. Sidney Wolfe, the group's founder and senior adviser, in a statement. "Had the FDA made this announcement last summer when the Canadian government acted, it would have reduced the number of U.S. prescriptions for and damage from testosterone, a medication of questionable effectiveness for a large proportion of users and one that increases the risk of heart attacks and strokes."